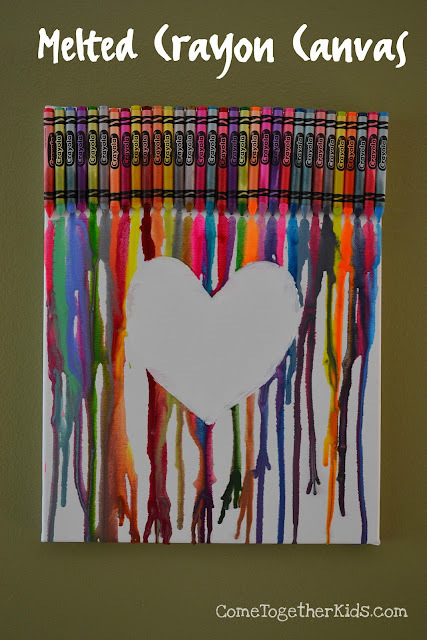 Ever since I first saw the melted crayon canvas idea popping up on Pinterest this summer, I've been wanting to try making one with the kids. This weekend, I finally pulled out a big box of crayons and a plain canvas and set out with my youngest to make one. and we love how it turned out. 1. I pulled out a big box of crayons and a blank 11x14" canvas. Then I had my daughter choose the colors she wanted. We lined them up across the top to make sure we had enough and they were in the order she wanted. 2. Next, we gathered the rest of our supplies ~ a hot glue gun, a heat embossing gun ( a hair dryer would work too, it just might splatter a little bit more ) and some contact paper. 3. Once we had the crayons arranged to our liking, I hot glued them in place across the top of the canvas. After some debate, we decided to leave the wrappers on, although it would look cool with unwrapped crayons too. UPDATE: When I made some more canvases HERE, I ran a line of hot glue along the edge of the contact paper shape. It really helped to minimize bleeding under of the melted wax. Just try to keep your glue line as flat and flush with the canvas as possible, so the melting wax can still go over it and drip down on your canvas. 5. Now that everything was in place, I put the canvas in a box to catch any drips and splattering wax and got my heat gun ready. 6. Woohoo, time to melt those crayons. My daughter got the biggest kick out of watching this step. Because I wasn't really sure how hot the gun would be and how much the hot wax would splatter, I did this step myself. However, with supervision, I know she could do it next time. The wax started melting within seconds of holding the heat gun to them. I first went across the top, melting each of the crayons a little bit. Then went back, holding the heat gun to them a little longer to melt them more. Finally, I moved the heat along the trails of melted crayon to get the melted wax going down to the bottom of the canvas. 7. Before the wax hardened all the way, we peeled off the contact paper to reveal our heart. She added the heart to a Valentine's card she made for the family. 8. As I mentioned, the contact paper did lift up in a few places as I was melting the crayons around it, so I did have a little bit of bleeding in some spots. 9. So, I grabbed some white acrylic paint and just neatened up the edges and put a light coat of white on the whole heart. My daughter had the idea to maybe write in the word "LOVE" or "FAMILY" inside the heart and we might end up doing that eventually. For now, we're just really proud of our colorful Valentine's Day artwork and really excited to try this technique again. I just did one the other day and I took the wrappers off....and what a pain that was! Took me an hour just to get 10 crayons ready to go! Love how it turned out. super cute - I like the wrappers on, too. That's really beautiful! Excellent choice of colors.. and I love how you fixed the little bit of bleeding with some white paint. Very clever. Thanks for sharing! I'm pinning. The heart is a great take on this idea. I've been wanting to try this too since seeing it on Pinterest. Yours canvas turned out super cute! Love the heart! I like the wrappers on! I don't have a hot gun would a blow dryer on the hottest level work or would that not be hot enough? Yes, a blow dryer would work too! You might have a little bit more splattering of the wax instead of straighter lines down (because the heat isn't quite as concentrated), but it will work fine! Love this version!!! We've made two canvases so far but just the drips. Might have to try this. I love your new spin on this, by incorporating the heart. I have to try this with my kiddos! I just love the way it turned out! We would love for you to share this at our link party! i am going to do it for my best friend's birth day present! yay! i love it! This is great. I have seen some of this on pintrest and wondered how to do it. Thanks for sharing! Thanks for sharing! This is so adorable! Thanks for linking up to Fabulous Friday! I can't wait to do some melted crayon art with Madison. I love it with the heart cut out! I've done my own before but your steps are really great. The box is a great tip for collecting all the splatter. I think I'll do that next time! So cute!!! I might try it with a letter too for one of my friends birthday! Thanks! 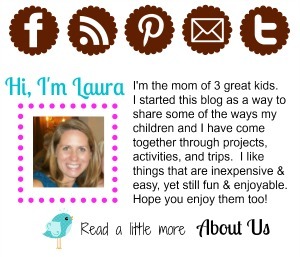 Laura, thanks for linking up! I love the addition of the heart. 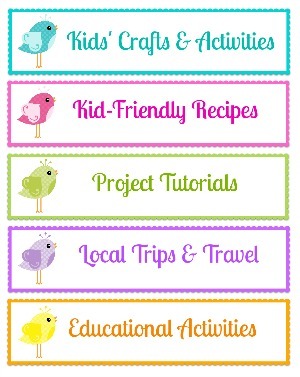 I've been planning on doing this with the kids and I just may add your heart to it! Thanks for sharing! Good question. I think foam board might work, but I'm not sure about posterboard. I'm thinking that the melting wax might make a bit of a waxy "shadow" around the color. I'd test it out with a couple crayons first. If it does work, it would definitely be cheaper using posterboard. I am about to tackle this project on a very large scale with metallic crayons and rollerskating ostriches. I ordered two make your own 64 packs of Crayola Crayons so I could get just the right colors. I'm going to make my husband take the wrappers off, though. The stress of that alone would make me give up! Thank you for the great idea. I'm so excited to try this - but instead of the heart - in which I love - I'm going to try two things. One - I'm going turn the canvas and put my daughters' names on with contact paper and see if it works - then, I'm going to do a second one with my daughters's hands to send to grandparents for Christmas. This was a great tutorial and I love your heart resist. I'm posting it on my squidoo page about melted crayons! Thanks! i love this idea and would want to try it. i wondered where you get all these ideas, maybe you have a great imagination! This is adorable. I will be doing this in the very near future with my youngest. I love all the creative things you do. Thanks! Let me know how yours turns out! I'm going to try this one day! This is adorable!! I've seen this on pinterest and loved it. You are a crafty one! Love the blog. How do you put the handprints on it? What a fun way to spend the weekend with kids. Thank you this article I really enjoying reading because for my kids apply to melted crayon..
GenBrain will command Give your tyke however many cheat sheets and different sorts of fantastic contribution as could be expected under the circumstances amid the 0-3 year time span. Subsequently, keep the correct mind open with perky right cerebrum . This is a very beautiful blog and very nice blog post. They can appropriately show lessons while they are substituting aesoponlinelogins how an employee is taken care of. A factor ought to be clear to accurately. Bedankt voor dit geweldige bericht. Het is uiterst nuttig voor mij. Zou je het erg het bijwerken van uw blog met meer informatie..
Norton Products helps you to protect your data on your all devices. You can protect multiple mac, phone,tablets from one subscription. Norton provides both Internet security and Antivirus for both version of PC and mac. In order to have clear picture, or if you have doubts or queries related to Norton products then you can contact Norton Customer Service 321-233-5007. Acmarket has an unique classification for all these sorts of video game. ACMarket There are much more attributes in addition to allowing you. McAfee offers all round protection not only from malwares or infected files; It protects by blocking all the unwanted hazards, such as phishing, scams, once you install your own MacFi Retail Card through www.mcafee.com/activate, you will get full security for your equipment. Best way to activate your product key is online through www.mcafee.com/activate, rather than CD. Once you enter product key, just follow all instructions given on your screen for activating McAfee. After successful activation of McAfee, it shows you download button. Click on download and install McAfee antivirus. thanku for the post, its really helpful article to me. Microsoft Office is one of the most common software being used by the computer users across the world. The entire suite includes a set of applications, services and servers. The set of application include PowerPoint, Word, Excel, Outlook, Access and more. Initially, a single suite with only version was available to everyone.